Nikon D2, D3, D700 and F6. Colour: Black. The battery case can provide your battery with a better protection, and make it from short circuit. Gross Weight（g） 45g. Better protection for your battery, make it away from short circuit. 1 x SD Card. Weight: 1.19lbs ( 538g). Tripod Mount Thread Size: 1/4" - 20 thread. ELASTIC NEOPRENE NECK / SHOULDER STRAP. Design "For Nikon". Internal Material : Soft Neoprene Padding With Anti-slip Weave, Black. Outer Fabric: Soft woven hardware neoprene. Outer fabric is very durable and soft neoprene. JJC Deluxe Lens Pouch is designed to carry a typical SLR lens. This pouch features heavy duty nylon construction with a soft interior. It will provide you great protection and shock absorption for your lens. SX400 IS, SX400IS, SX410IS, SX410 IS, SX420 IS. CANON POWERSHOT. ELASTIC NEOPRENE NECK / SHOULDER STRAP. "For Canon". CANON REBEL EOS T7i, 77D, SL2, XL2, XL1, G10, T1l, XSi, 1D, 5D, S50D, SX60, SX50 HS, 70D, 7D, 6D, 60D, 1V, SX20 SX10IS SX1 IS and more. The bright colour of the strap is easy to see in pools, lakes or oceans. The circumference of wrist strap is adjustable via the adjustable band with a snap-fastener. The max circumference of wrist strap is 300mm / 11.8". Filter Kit UV, CPL, FL-D Filters 72mm Case. Lens Flower Hood 72mm. Lens Cap 72mm with Holder. Ever find yourself with a great photo opportunity but you just cant get close enough to take that really great shot?. ELASTIC NEOPRENE NECK / SHOULDER STRAP. "For Panasonic". Internal Material : Soft Neoprene Padding With Anti-slip Weave, Black. Outer Fabric: Soft woven hardware neoprene. Outer fabric is very durable and soft neoprene. Fits for Nikon D750 D610 D600 D7200 D7100 D7000 D5100 D5000 D90 D80 D70S D70 D60 D300s D300 D200 F80 F65 F55 FM10 replace Nikon DK-21 DK-23 eyecup perfectly. Nikon D750 D610 D600 D7200 D7100 D7000 D5100 D5000 D90 D80 D70S D70 D60 D300s D300 D200 F80 F65 F55 FM10. This series soft release buttons are divided into two different shapes- concave surface and bulged surface. There are nine colors available for you now. JJC SRB-B10R Soft Release Button bulged surface - Red x 1. NIKON SLR D60 D70 D80 D90 D100 D200 D300 D700 D3000 D5000 D300S D610 D800 D800E D4S D7100, L840 L830 L340 L105 P600 P610. 1 J1 1 V1 D90 P500 L120 L830, L820, L810, L840 P7800 FM10. FOR NIKON COOLPIX P80, P90. The shatter-proof glass blocks UV rays while allowing visible light in. The protector surface is also resistant to water, oil and fingerprints. 2.5D round edges provides a very comfortable and smooth surface to grip and prevent the edges from scratching fingers during installation. Adapter/Tube for Nikon CoolPix L810 L820 L830 62mm. 0.43x HD WIDE ANGLE LENS With MACRO 72mm. 62mm Mounting. Lens adapter tube with 62mm front filter threads. UV (Ultraviolet) filter62mm. Adapter: Lens adapter tube with 72mm front filter threads. To 99 hrs., 59 min., 59 sec. The maximum number of exposure is 399. 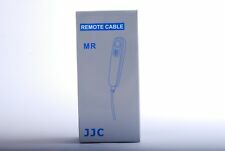 JJC® Patent Product. D810 D4s D2H D1x D1h D1. D2x D100 D200 F5 D2Xs D3. D3s D4 D300 D300s D700 D800. F6 F100 F90 F90x D5 D500. NIKON MC-36/KODAK/FUJIFILM. 6 XQD cards. Each slot is strictly tailored to fit the card perfectly and protects the cards from going around. In addition, the side of the case has a hole for easy carrying. Gross Weight. Each slot is strictly tailored to fit the card perfectly. Nikon D3300, D3400, D5500, D5100, D3200, D750, D610, D600, D5200, D7100, D7200, D5300, D5600,etc. JJC EN-3 Eye Cup for Nikon x 1. The Eyepiece is designed to seal out stray light for improved viewfinder optics. Using a remote allows you to move about more freely, giving you more freedom when taking group photos. Cost is calculated based on weight. Cowboystudio Flash Stand for Nikon SB800 SB600 Canon EX430 EX 580 EX580II. 1/4"-20 tripod socket. 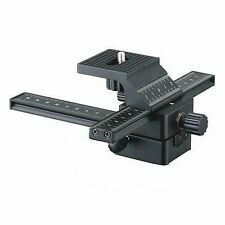 This mini flash stand can be used to stand all flashes that fit into a standard ISO 518 hot shoe. It can be used for Canon flash such as 580EX II, 580EX, 550EX, 430EX, 380EX and 220EX models. 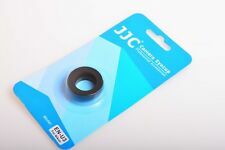 JJC NS-OA1 is suitable for most common strap ≤ 12mm in width. JJC NS-OA1 includes a pair of circle ring and a pair of protective leather. Place the protective leather over the eyelet. Open the circle ring by fingers and hook the strap eyelet in the ring opening. Cable-B replaces NIKON MC-30 / MC-36 / MC-36A. Cable-G replaces NIKON MC-DC1. Cable-M replaces NIKON MC-DC2. Cable-A replaces CANON RS-80N3 / TC-80N3. Cable-R replaces FUJIFILM RR-90. Cable-O replaces FUJIFILM RR-80A. Nikon Df, D90, D3100, D3200, D3300, D5000, D5100, D5200, D5300, D5500, D5600, D600, D610, D750, D7000, D7100, D7200, D7500. 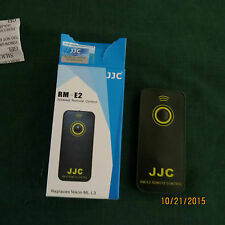 1x JJC Remote Shutter Release (replace Nikon MC-DC2). Shutter release button with lock - for long exposures shooting and continuous shooting. The soft release buttons are made of brass. This series soft release buttons are divided into two different shapes- concave surface and bulged surface. Just screw the SRB soft release button into shutter release button’s threads and you will enjoy the soft and steady shutter release operation. Real Leather/Genuine Leather, with poppers and velcro fastening. One JJC NLP-15 Neoprene Lens Pouch. Crafted from neoprene, soft and durable. Compatible lens size:89 x 150mm / 3.5" X 5.9" (D x L) lens. Handy drawstring closure for easy access to the lens. Easy to use. One JJC NLP-28 Neoprene Lens Pouch. Compatible lens size:100 x 280mm / 3.9" X 11" (D x L) lens. Crafted from neoprene, soft and durable. Handy drawstring closure for easy access to the lens. Easy to use. One JJC NLP-28 Neoprene Lens Pouch. Crafted from neoprene, soft and durable. Compatible lens size:100 x 280mm / 3.9" X 11" (D x L) lens. Handy drawstring closure for easy access to the lens. One (1) Neoprene Neck Strap for Nikon. Non-slip rubber inside. Tripods/Ball Heads. High quality. Cost is calculated based on weight. FLOWER LENS HOOD 62mm. Lens cap 62mm Holder. IncludedSnap-On Lens Cap 62mm with a Cap Keeper- High quality plastic snap-on lens cap for speedy installation and removal. Extra strong design with double action springs. JJC MSA-11 Adapter Converter is made of fine finish aluminum. What’s more, the bottom of the adapter has a 1/4"-20 threaded hole to accept anything else that has a 1/4-20 receptacle. 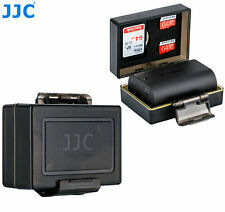 JJC FC-26 series flash diffuser is designed for most popular flash units. It soft and diffuse the light output, providing soft bounce lighting to produce soft shadows rather than harsher effect when using a direct flash. Total Length: 125.2CM Middle Length: 43CM PU Length: 5.1CM for both sides Rope Length: 34CM Material: Diving Suit Material (neoprene) and the inner layer is High Density Rubber Leather on both ends. JJC New deluxe lens pouch series is designed to carry a typical SLR lens, available in 7 different sizes to fit a wide variety of lenses. JJC DLP-3II lens pouch x 1. CANON ZOOM LENS EF 100-300mm 1:4.5-5.6(can still be accommodated in the pouch with a lens hood placed backwards). One JJC NLP-17 Neoprene Lens Pouch. Crafted from neoprene, soft and durable. Compatible lens size:90 x 170mm / 3.5" X 6.7" (D x L) lens. Handy drawstring closure for easy access to the lens. Easy to use. For ease of use, the case is opened and closed with a touch-fastening flap. The case features stylish edge stitching for a handmade appearance, which makes it attractive. In addition, photographers have the option of using this case with or without a neck strap. It has high transmittance up to 95% to show the clear image of the LCD screen. Scratch Resistance Index: 9H. Glass Protector x 1. Free cleaning tools to clean LCD monitor before installation. Strictly tailored to fit each screen perfectly. Compatible models: Nikon D300, D200, D100, D3, D2H, D2X, D1X, D1H, F100, F90X. One (1) Shutter Release Cable. Two-step button switch with lock function for b-mode. Length of cable: 80 CM. Support Systems.